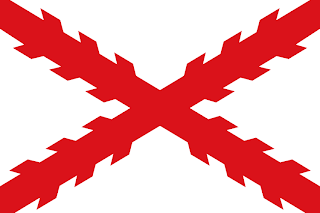 Mexico was settled by Spain in the 16th century under the red saltire banner of Spain. 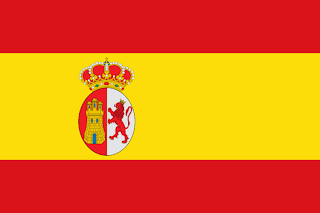 Later, this was replaced by the new royal Spanish flag with the state coat of arms in the central yellow stripe, close to the hoist. 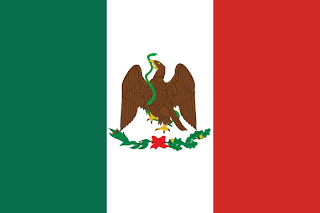 However, after a massive struggle for independence, Mexico finally won its independence from Spain in 1821. The Provisional Government adopted the flag of the Three Guarantees. Flown by the army during its campaigns against the Spanish. A diagonal tricolour of red, green and white. With 3 gold stars. 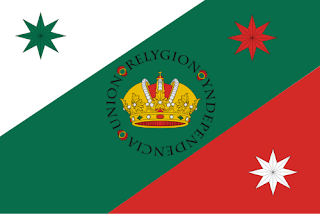 As Mexico moved towards becoming a monarchy, the Three Guarantees flag was altered. With the gold stars being changed to match the colours of the flag, and a crown being placed in the centre. Once the first Mexican Empire was declared, the flag was altered again. This time, settling on a standard tricolour in the same pattern of Italy. Green, white, and red. In the centre, they placed the Mexican coat of arms. A Mexican Eagle standing on a cactus with a crown on its head. This image is taken from the legend of Tenochtitlan. The crown was placed on the Eagle to represent the Empire. The Empire was very short-lived, with a revolt in 1823 turning Mexico into a republic. The new flag kept the tricolour, but altered the coat of arms. The crown was removed, and the eagle was changed to be attacking a snake. Again, from the legend of Tenochtitlan. However, the legend was slightly misconstrued, and the snake was taken to represent evil, and the Eagle represents good. Also, two wreaths of laurel and oak leaves placed surrounding it.The green in the flag represented independence, the white represented religion, and red represented union. 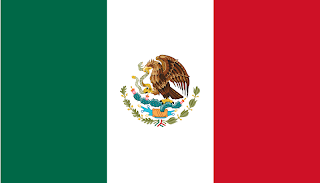 In the 1860's, France invaded Mexico, and helped establish the second Mexican Empire, this time under Archduke Maximillian of Austria, later, Maximillian I of Mexico. His flag kept the tricolour, but altered the meanings. Green now represented hope, white represented purity, and red represented religion. Also, his personal coat of arms was placed in the centre of the flag, with gold eagles placed in each corner of the flag. It was introduced in 1864. In 1867, Mexican republican forces managed to overthrow Maximillian I, and he ended up being executed. 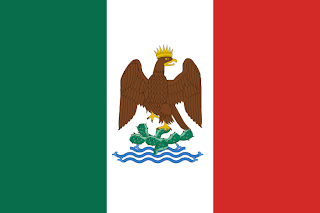 The new Mexican Republic re-adopted the previous Republican flag of Mexico. 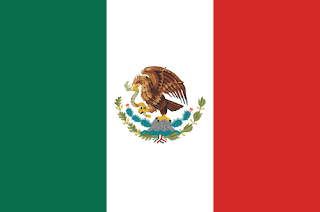 Under Porfirio Diaz, Mexico altered its flag yet again in 1893. This time, altering the Eagle, and removing the cactus plant. In 1910, with Diaz winning the election for the 5th time under a cloud of massive fraud, the 1910 Mexican Revolution got under way. Mexico dissolved into chaos and finally, in 1917, a new constitution was agreed to. At the same time, a new flag came in. Keeping the theme of the eagle on a cactus with a snake, but updating the artwork into something similar to the flag today. It also saw the nation change its name to "The United Mexican States." In 1934, the flag was tweaked a little, with the 2 wreaths of oak and laurel where extended to nearly encircle the eagle. Then finally, in 1968, the current flag was adopted. The eagle was placed into an slightly more upright stance, and the wreaths where shortened. 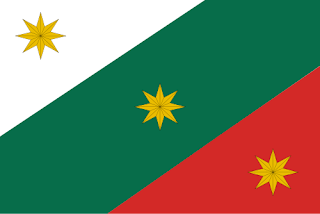 The colours meaning had been altered again with the creation of the new republic.Green represents hope, white represents union, and the red represents the blood of Heroes. 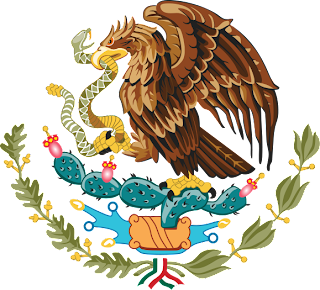 The current coat of arms has many meanings for the Mexico. 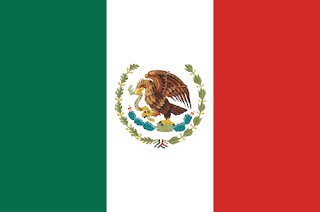 The Eagle represents the Mexican people, and its stance represents the peoples desire to face all challenges. 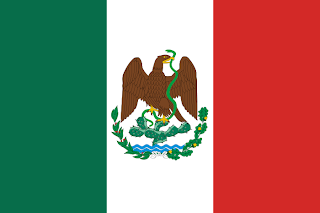 The snake represents the enemies of Mexico. The fact that the snake is being eaten means that the Mexicans will prevail over their enemy. The Nopal (Cactus) represents the challenges before the Mexicans. 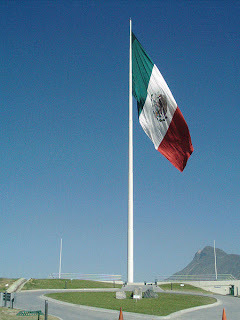 The Eagle standing on it represents the Mexicans desire to overcome. The earth and water represents the mix of people, and the wreaths represents victory. 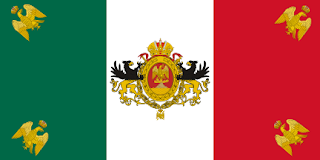 Since the end of the second Mexican Empire, the colours where given new meanings. The green represents hope, white represents union, and the red represents the blood of Mexico's heroes.